I was driving the BMW i3 for a week. Here are my thoughts. Please keep in mind that I am looking at the vehicle through my software engineer glasses. This may not be the type of driving report you expect. The car comes with three pre-defined driving modes. Comfort, ECO PRO and ECO PRO+. Using the ECO PRO driving mode, one can sacrifice performance of acceleration and air conditioning for an extended range. The ECO PRO+ mode extends the range even further by completely shutting down air condition and heating and also limiting the maximum driving speed to 90kph. The i3 is said to easily drive a 150km distance in perfect weather conditions when fully charged. 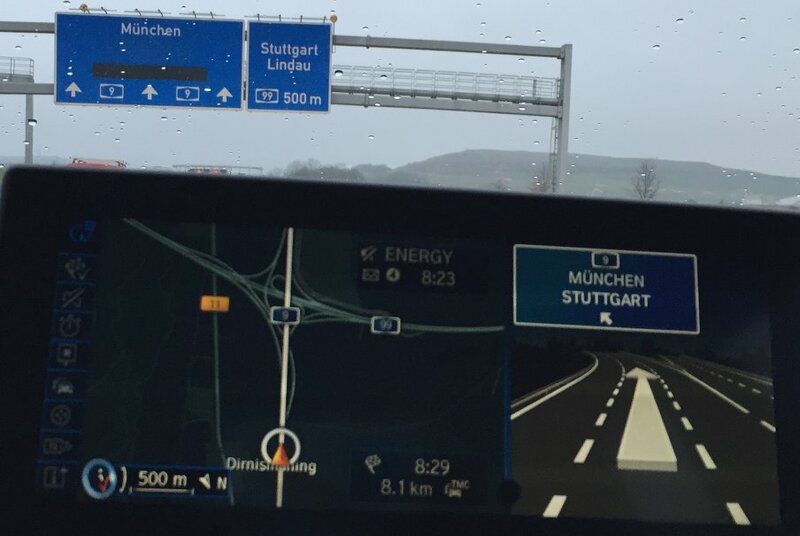 Instead of the typical instruments known from fuel-burning vehicles (rev meter and speed indicator) the i3 comes with a LCD presenting the most vital information. In the middle of the screen resides a larger-fontsized number indicating the current driving speed. Below that there is a curved bar that shows whether the car is consuming energy (white indicator goes to the right) or generating energy (white indicator goes to the left). Energy is reclaimed as soon as one slows down, either by throttling or by hitting the brakes. To the right there is a trip counter and driving mode indicator (here: ECO PRO+). The bottom line hosts the range extender fuel level and the battery charge level. Both use a distance as unit (here: km). I found the distance information to be very precise and overall helpful. Take a look at the cruise control: The green symbol, indicating cruise control being enabled is not on the display itself, but resides above it. 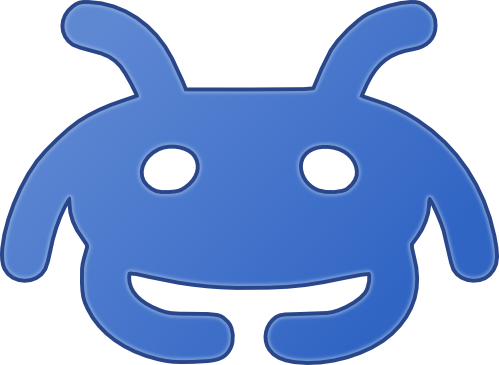 It uses a LED-backlit hardware symbol. The red icon, indicating that cruise control, although being enabled, is inactive at the moment, however, is on the display. Unless it has to do with absurd regulations, I do not see good reasons for preferring backlit hardware symbols over software icons on displays. And I see even less reasons for a combination of the two. A display is universal, a hardware symbol is not. The latter can not be changed using software updates. Hardware symbols feel half-baked and from a different time. This car has hardware knobs and buttons. BMW is reducing the number of buttons in its cars, at least they say so. But this car still has too many of them. Furthermore, it has buttons for the wrong things. There is, seriously, a dedicated button to enable or disable the traffic program (TP) of analog VHF radio. Where shall I start? Why is VHF radio still there? Why does the car have VHF radio but not DAB? And if only one type of radio is provided, why does it have to be analog VHF instead of DAB? Who listens to the traffic news, anyway? This is data generated by computers to be read by computers. It’s 2015, please stop reading the traffic news to an on-air microphone. We have TMC and… the Internet! Even if someone is interested in listening to the traffic news, he or she may put that function on one of the eight programmable buttons. Did you know that the useless TP button is placed right next to volume control? Where one would expect the next item button (formerly known as fast forward). And how do you feel if I tell you that the next/previous item buttons are on the other end of the panel? Forcing you to lean sideways and reaching out, eventually paying less attention to traffic? There are hardware buttons for things that could easily be integrated into software, only showing up when he context is right. Of course, the display has to be touchable for that. Guess what, it is not. 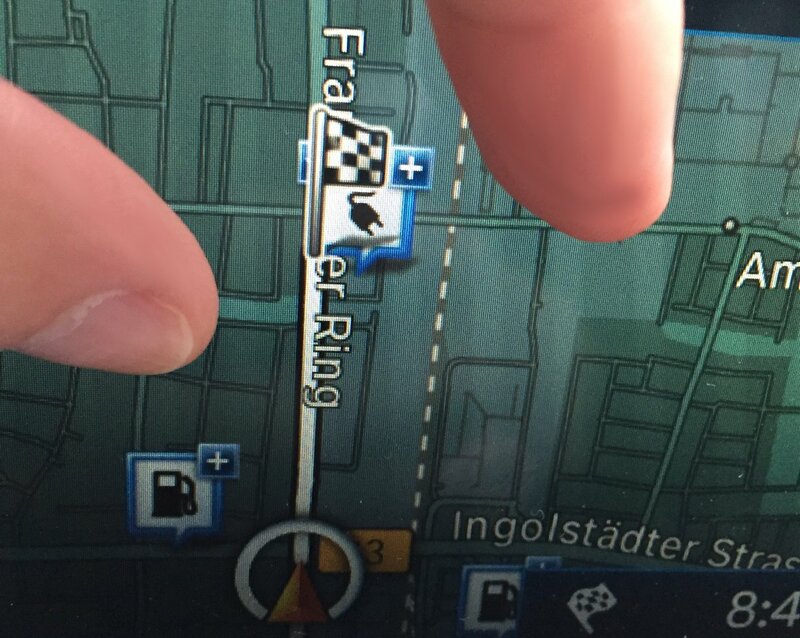 Zooming into the map using the very common two-finger gesture fails. It is 2015. We should be able to touch displays. Actually, non-touchable displays within arm’s reach are so uncommon to youngsters, that I have witnessed more of them trying to touch displays in cars than going for the knobs. The navigation system is good, more or less state of the art. It uses non-distracting colors. It lacks social driving, but I did not expect that anyway. The speech recognition requires very formalized answers but works fine then. I don’t think it is using a state-of-the-art artificial neuronal network for semantic recognition. Actually, I doubt it uses one at all. It feels more like the speech recognition system of my 2008 Audi A6 than anything close to Siri or Google Now. It is the machine in the monkey that makes this system work, but it should be the monkey in the machine. To be fair, digital personal assistants like Siri and Cortana are not very satisfying to work with, too. They just feel more natural. The model I drove features a range extender. It means that there is a small internal combustion engine installed in the back of the car. It can be used to generate electricity on the go. It is not connected to the live axle in any way, it is just a small generator for holding the battery charge state while driving. Once enabled, it turns on and off automatically while driving. It really disturbs the wonderful silence of electric driving, but saved me more than once. It can not be used to re-charge the battery, at least I did not find any such function in the software. For some reason, despite having too many knobs and buttons, the i3 does not have a button to enable or disable the range extender. To enable or disable the range extender while driving, I had to walk down the following path: Press MENU, scroll, scroll, scroll, press Settings, scroll, scroll, scroll, press Range Extender, scroll, press Hold charging state, press back multiple times. This, however, is one of the functions so fundamental to this vehicle, that it actually deserves a hardware knob. Ridiculous. The only way out is, to abuse one of the eight programmable buttons from the entertainment system and connect it to the mentioned menu option. It is so outside the concept of how things should work, that I would not even tried to link a radio station button with a fundamental car function. The only reason I tried is, because I was told it was possible when BMW handed me over the car. Hold your breath, WAP is back! 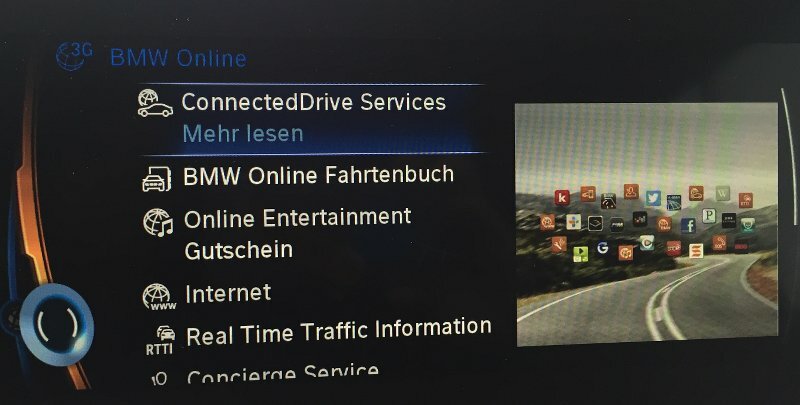 Being short on time, I only did a quick test of the digital services available in the BMW Online sub menu. So just a few notes here. First thing I noticed is, that my preferred language setting (English) was not respected. Everything in that sub menu is German. Don’t be confused of the many English words on the photo. Yes, we do have plenty of English words incorporated into the German language nowadays. It is unclear whether this is a general bug or whether it depends on the location of the 3G modem. However, it can be tricky for a foreigner wanting to use BMW Online when he or she is not used to German words. Everything in BMW Online is slow, although being connected via 3G. And 3G in that area is usually not slow at all, regardless of the mobile network used. It feels like WAP on a feature phone. I want to touch the display. It feels wrong to use social media apps by pushing hardware buttons or turning knobs. Charging the i3 is easy and straightforward. 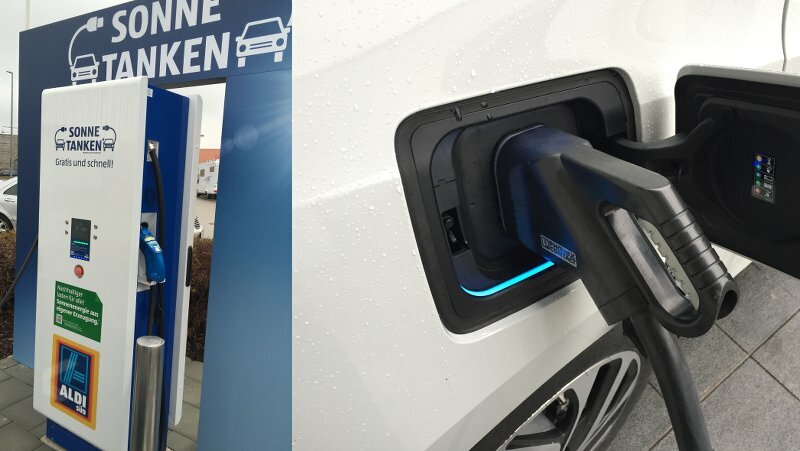 Either connect the car with a SchuKo power plug or visit one of the few public charging stations. Charging stations are still very rare in Germany, but supermarkets and parking garages start to deploy them on their premises. Being a customer at one of these often gets you free juice for the battery. Charging to 80% battery level takes about 30-45 minutes, depending on the power of the charging station. After that the charging process slows down significantly. 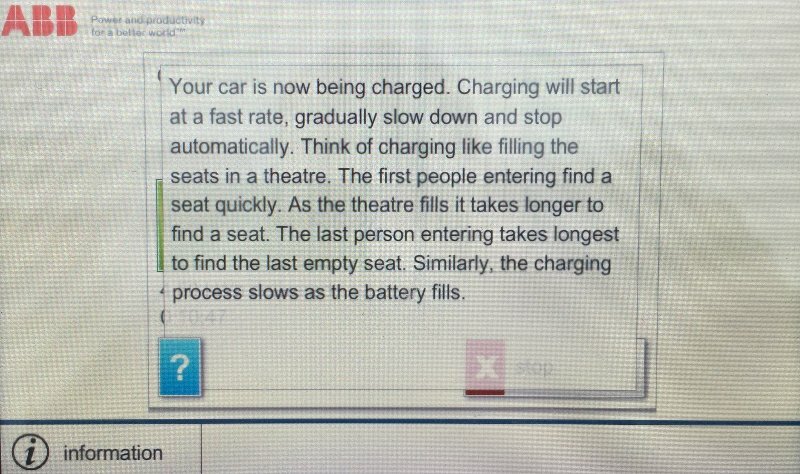 I liked how one of the stations explained the charging curve by comparing it with a theater being filled with audience. Electric driving is fun. Speed limits are not. With electric driving, speed limits become even more of a driving pleasure disturbance as they already are. Nevertheless, I do have to obey the speed limits, don’t I? Legally speaking, of course I have to. And I did. But this one made me feel that I was treated unfairly. The wonderful German word Luftreinhaltung means air quality control. So, if Luftreinhaltung is the reason for the imposed speed limit of 50 kph here, do I have to obey it when I drive an emissionless vehicle? If yes, isn’t that unfair? Driving an electric vehicle in an area where charging stations are rare leads to some notable behavior changes. I noticed that I visited the airport more often this week, because it provides free charging. Living nearby the airport, and the airport being a 24⁄7 heaven for spending money, it already is a place i visit regularly. Usually, malls and shops close very early in Bavaria due to insane regulation. The airport is one of the locations where this regulation does not apply. Groceries shopping started with a web research on which supermarkets provide charging stations. Using shopping time for charging is convenient and the availability of free charging greatly influenced where I bought my groceries that week. I stayed longer in the supermarkets, knowing that every minute will charge the battery even more. One time, when my girlfriend and I just left the store, we noticed that we did forget to buy a rather unimportant item from the shopping list. Looking at the charger and the remaining time we decided to head back into the store and get that item. We would not have done this using a traditional car. There is only one thing that really annoys me about electric driving: The noise of the fuel-burners around me. I did not expected the noise to be that loud. Once you drive silently, perception changes. People often approached me when I was charging the car, shyly asking about the car, electric mobility and related topics. Interesting conversations! Sometimes I felt like a BMW salesman, other times people explained how they ended up having a Tesla S, almost apologizing for it. I never heard so many Germans apologizing for owning an expensive car before. Strange experience. Next time I buy a car, I will focus on electric vehicles. There must be a very, very good reason to convince me to go back to internal combustion. I do not miss it at all. And that’s coming from someone who’s perfectly fine with burning 10+ liters of gas on 100km. I would like to thank BMW Munich for the great opportunity to stress-test the vehicle over the period of a full week. I would not have been able to dig that deep into the i3 in only a day or two. I brought back the BMW i3 today, and immediately started missing the car. FYI: I’ll be speaking at the Automotive Allstars conference 2016 about software, security and the automotive industry.